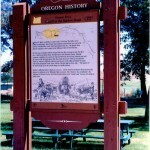 Samuel K. Barlow established a wagon road in 1845-46 from The Dalles across the Cascade Range. Many Oregon Trail emigrants preferred the new road to the perilous Columbia River route, which had claimed many lives. 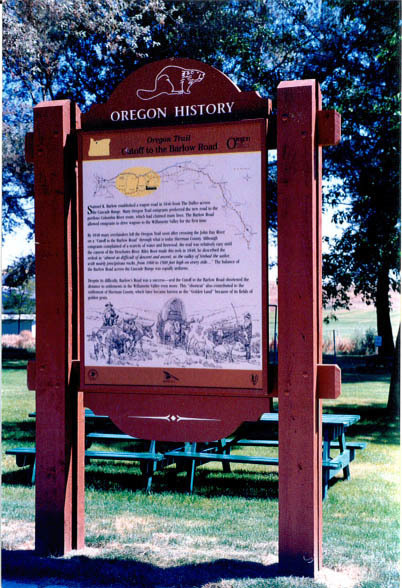 The Barlow Road allowed emigrants to drive wagons to the Willamette Valley for the first time. By 1848 many overlanders left the Oregon Trail soon after crossing the John Day River on a Cutoff to the Barlow Road through what s today Sherman County. Although emigrants complained of a scarcity of water and firewood, the cutoff was relatively easy until the cayon of the Deschutes River. Riley Root made the trek in 1848 describing the ordeal as ‘almost as difficult of descent and ascent, as the valley of Sinbad the sailor, with nearly precipitous rocks, from 1000 to 15000 feet high on every side…’ The balance of the Barlow Road across the Cascade Range was equally arduous. Despite its difficulty, Barlow’s Road was a success and the Cutoff shortened the distance to settlements in the Willamette Valley ever more. The ‘shortcut’ also contributed to the settlement of Sherman County, which later became known as the ‘Golden Land’ because of all the fields of golden grain.